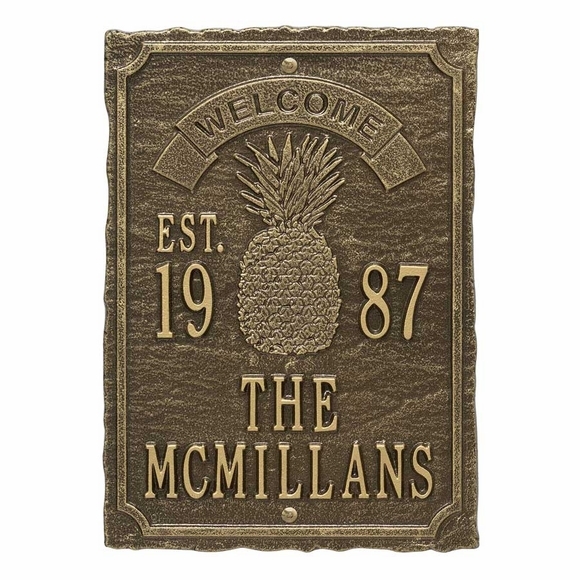 Custom Welcome Plaque with Pineapple - - a traditional symbol of warmth, welcome, and friendship. Custom made Welcome sign greets visitors with old-fashioned hospitality and graciousness. 9" x 12.5" rectangle. Wall mount. Made in USA. In addition to the central pineapple, unique design features include the split date, fluted edges, border with concave corners, and ribbon banner. The words "WELCOME" at the top and "EST" beneath it are part of the design. You supply the year on Line 1 and the two lines of personalized wording at the bottom. Line 1 holds up to four (4) 1.75" digits, typically the year the home was built, wedding year, or business or professional practice was established . Line 2 holds up to ten (10) 1.25" characters. Line 3 holds up to ten (10) 1.25" characters. Large image is shown in antique brass. Smaller images (from left to right): antique brass, antique copper, black/gold, bronze verde, oil rubbed bronze, bronze/gold, and pewter/silver. Dimensions: 9"W x 12.5"H x 0.32". Custom made Welcome Sign with Pineapple greets visitors with old-fashioned hospitality and graciousness. Made in USA.